Browse our robust selection of metal cookie cutters in various shapes and sizes. With over 150 different designs to choose from ranging from birthday, to Christmas, to Halloween, to letters and numbers, you are sure to find specialty cookie cutters for all your baking needs! 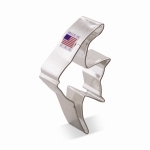 Not only do we offer top customer service and fast shipping, but our inexpensive metal cookie cutters, made by The American Cookie Cutter Company, are also Made in the U.S.A. These specialty cookie cutters are both incredibly affordable and made with high quality material. Since the 1960s, CK Products has been designing creative cookie cutters that are used in homes and bakeries all over! Shop today and receive free shipping on all orders over $100. Have a question or don’t see what you are looking for? Please call us at 309-747-2125 – we would love to hear from you!